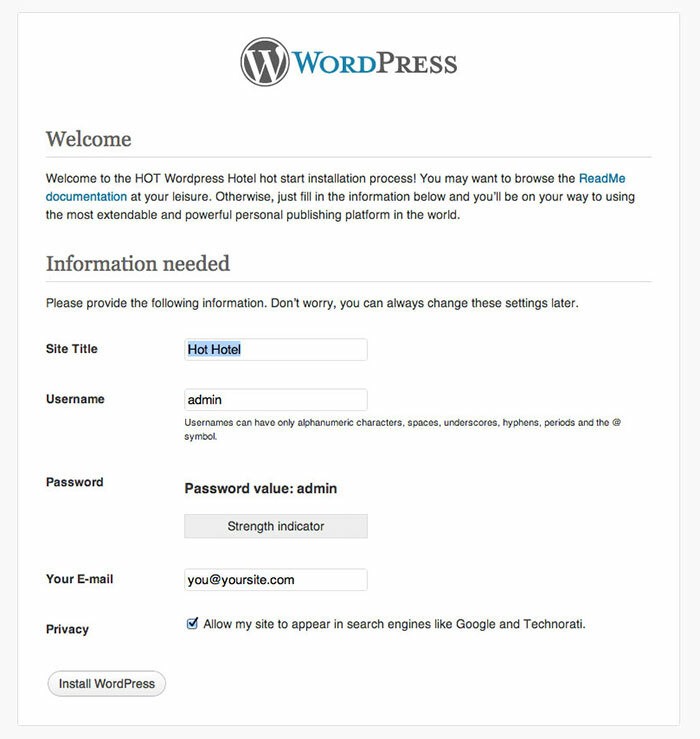 This document will guide you how to install any HotThemes WordPress theme onto your server. It will also describe some features of our themes. However, it’s not a WordPress training and it’s assumed that you know some basic things about web design (see Assumptions part). Not Too Excited About Reading Guides? Unzip (unarchive) what you downloaded prior to using it! Don’t install this WordPress theme as you usually install themes. This will not install any demo data that you saw on our demo site! Make sure you follow HotStart installation part to install this theme properly! 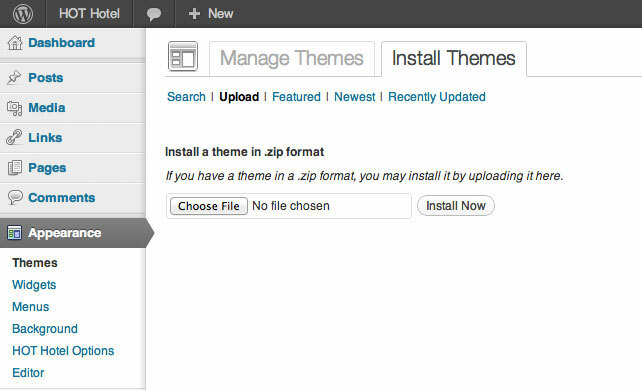 You don’t need to install WordPress prior to theme installation! 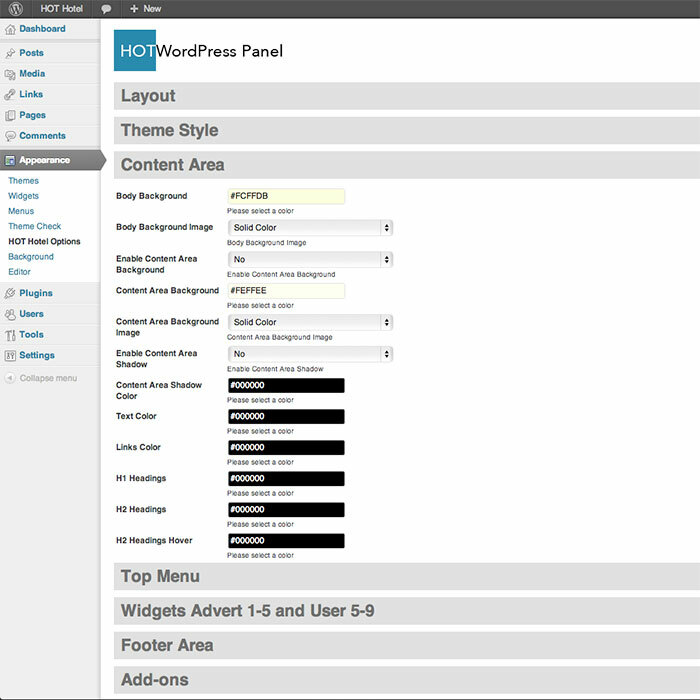 The latest WordPress is included in the HotStart theme installation. It’s assumed that you know what’s ZIP and how to unzip the archive you downloaded. In all popular operating systems (Windows, MacOS, Linux…) this can be done from file manager (Windows Explorer, Total Commander, Finder…). It’s assumed that you know what’s FTP and how to use it. You can use any FTP program to upload files onto the server, however, we strongly recommend FileZilla. We found it as a stable and reliable software. 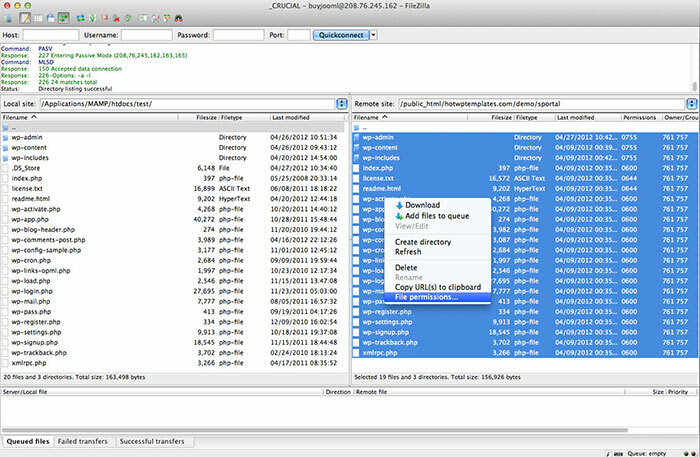 It can be downloaded for all platforms for free here: http://filezilla-project.org. If you don’t want to use FTP, files can be uploaded from online file manager (if your hosting provider supports this). If you need to edit a file that’s a part of our themes or plugins, please use only plain type text editors. On Windows, you can use Notepad (and you must not use WordPad or MS Word). On Mac, you can use TextEdit, but make sure it works in Plain Text Mode (TextEdit > Preferences > New Document > Plain Text). It’s assumed that you have an hosting account that’s compatible with WordPress. 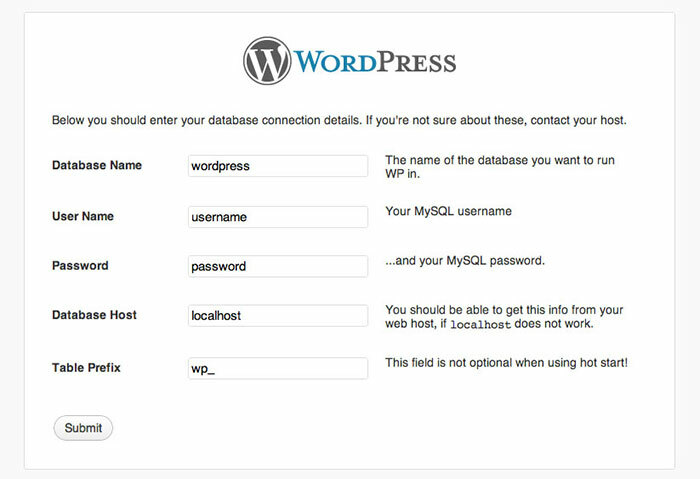 Check technical requirements of WordPress and make sure your host meets them: http://wordpress.org/about/requirements. If you don’t have an hosting account yet, we any Linux hosting packages based on cPanel, because they’re reliable and 100% WordPress compatible. This is the most common error! You should not install theme through WordPress! Please read HotStart Installation section of this document to install the theme properly! You should not install WordPress prior to theme installation! If you want to copy demo data that comes with the theme, please follow HotStart Installation instructions instead. 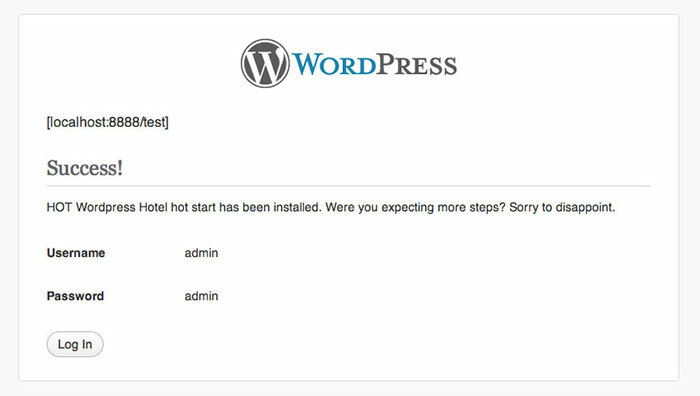 This method contains a new WordPress installation. This is the only way to copy the demo data! If you have a live site that already contains data, you may insist not to install a new WordPress. But you can’t copy demo data in this case (it would overwrite your site’s data) and you must setup everything manually. There will be a lot of work (depending of the size of your site), so we recommend you to install our theme with demo data (HotStart) separately and to check how the things are set up. Then, you can copy settings on your site. You have purchased this product (most likely) because you were impressed with our demo! Now, you expect to see that same on your server. This is possible if you install theme using the HotStart installation method. Once you finish this installation method, you should get exactly the same copy of the theme demo site on your server. Let’s start! Download the archive hot_themename_wp_unzip_first.zip from our server. Unzip it on your computer. It contains several files. One of the files is hot_themename_hotstart.zip. Create a separate folder on your computer and unzip hot_themename_hotstart.zip there. The unpacking may take several minutes. If you did it well, you would see several folders and files (see image). All these files and folders actually represent a WordPress installation package. It’s modified to copy our demo data instead of default WordPress demo data. Using the FTP program (such as free FileZilla) upload all files and folders (that you unpacked in the previous step) to your hosting space. There are many files (several thousands), so it may take some time, depending of your upload connection speed. The left pane of your FTP program represents the folder on your computer where you unpacked hot_themename_hotstart.zip archive. The right pane represents a folder on your web hosting space. If you’d like to install theme in the root site folder (to see it when you go to www.yoursite.com), make sure you’re uploading files into site’s root folder. To find out what’s site’s root folder of your hosting space, consult your hosting provider. At the end of uploading process, your left and right pane must contains the same files and folders. Make sure there are no files in the “Failed Transfers” pane (bottom). If there are some files, upload them again. This is very important, especially if you uploaded files through the hosting’s control panel. Make sure the folder where you uploaded files is readable by the server (all folders should have permissions set to 755, and all files should have permissions set to 644). 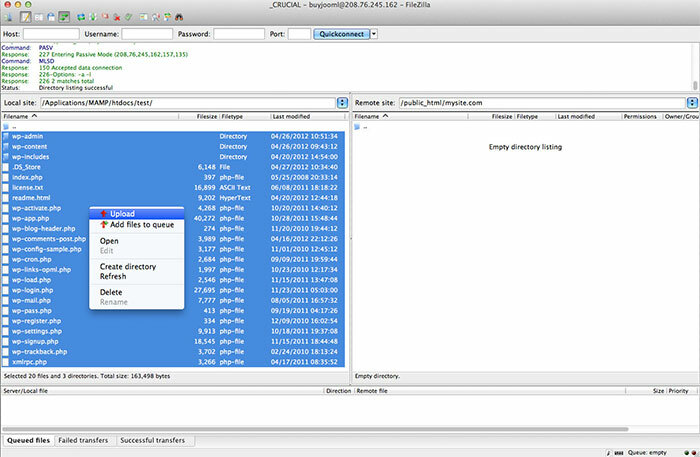 You can check this in the “Permissions” column (the right pane) in FileZilla. Enter 755 in the field “Numeric value”. Select “Recurse into subdirectories” option and select “Apply to directories only”. Click OK and FileZilla will change permissions of all folders. It may take several minutes. Now, repeat the procedure for the files. Select all the files and folders (in the right pane) again, right-click and select File permissions… Enter 644 in the field “Numeric value”. Select “Recurse into subdirectories” option and select “Apply to files only”. Click OK and FileZilla will change permissions of all files. It may take several minutes. Make sure once again that all files and folders have correct permissions. Look at the permissions column. Browse the folders (such as “wp-admin”, “wp-content”…) and make sure that files and folders inside them also have the correct permissions set (755 for folders, 644 for files). If you can’t change the permissions, maybe it’s not allowed by your hosting provider. Ask your hosting provider to change permissions of the uploaded files and folders for you. You most likely received these when your hosting account has been activated. If you don’t have those 4 MySQL connection parameters, please contact your hosting provider. In case that you uploaded the HotStart files in the root folder of your hosting space, in browser go to http://www.your_site_address.com/index.php (change “your_site_address.com” with your site address. If you uploaded the HotStart files into a subfolder of your hosting space, you should go to http://www.your_site_address.com/subfolder/index.php (change “subfolder” with folder name where you uploaded files. If you got 404 error (page not found), you probably missed the root folder. Root folder of your web hosting space are usually named as “public_html” or “html”. But it can be anything else. Contact your hosting provider and ask where is your site’s root folder, if you are unsure. If you see this screen on your browser, you’re on the right path! You should click “Create a Configuration File” button and WordPress installer will create the configuration file. On the next screen, WordPress installer asks you to have database connection parameters ready. We already explained that. You can click “Let’s go!” button on this screen. You should enter MySQL database connection parameters (that you prepared in Step 4) now. 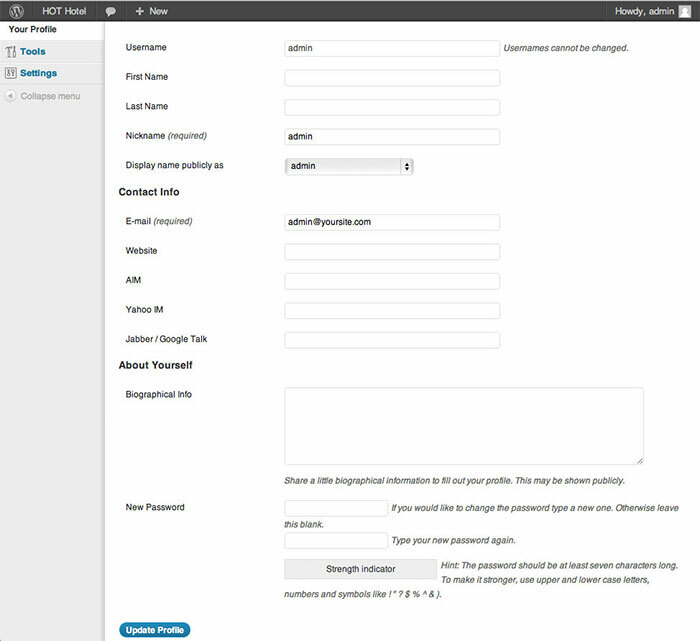 Enter your Database’s Name, Username, Password and Database Host into the fields. You must leave the Table Prefix field unchanged. Click Submit. If you got an error message, please check database parameters. It’s important to enter them correctly. Hostname is address of your MySQL server (can be localhost, IP address…). Database Name is the name of your database. Username is the name of the user that connects to the database (don’t mix it with database name). Password is a secret word that User uses to connect to the database. If you don’t know correct parameters, please contact your hosting provider. If you see this screen, your database parameters are OK and you are on the good way to accomplish this process. Click “Run the install” button on this screen to proceed. On this screen, everything is pre-entered and you can change anything. The installer will give dummy name for your site, create administrator’s account and enter a dummy email address. Don’t worry! You can easily change everything later, when we finish HotStart installation. For now, just click “Install WordPress” button. The last screen of the HotStart installation gives you information that you successfully accomplished the procedure. Under the WordPress logo, between the brackets [ and ], you can see the link of your new site. You already know that (we hope 😉 ), so this is just one more confirmation that installation is done. From here, you can see your new site (enter link in browser) or you can click “Log In” button to enter WordPress Dashboard. Please click “Log In” button and enter “admin” (without quotes) for both username and password. Click “Login” button. The first thing to do is to change the unsafe username and password. 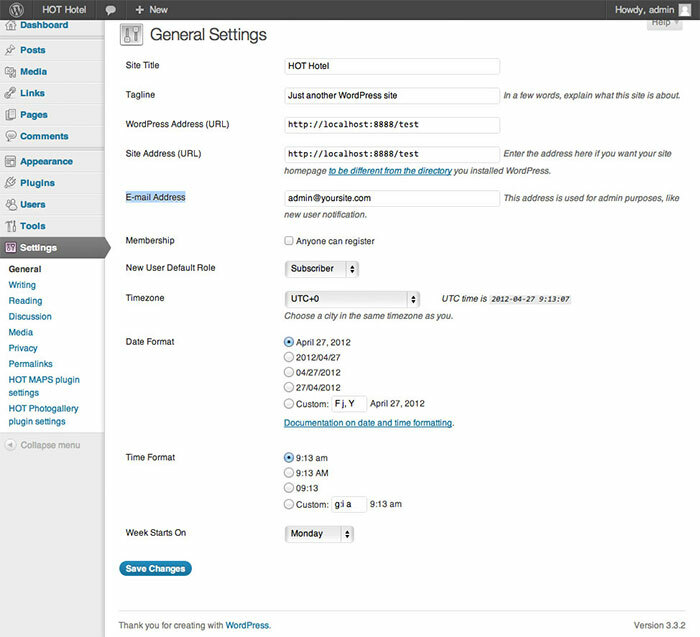 In WordPress Dashboard, in the left column, click Settings > General. Change e-mail address and site name and slogan (if you need to). Click “Save Changes”. Finally, in the left column of WordPress Dashboard, click Users > Your Profile. On this page, you should change your password (enter it twice). Also, you should change email address and enter the real one. The rest information can be entered, but they are not mandatory. Finally, click “Update Profile”. Keep your password safe and don’t forget it. If you forget it, your WordPress can send you the reset password link, but only if you entered your real e-mail address. If you are about to start a new website, it’s strongly recommended to use HotStart method! The Basic Installation method assumes that you don’t need our demo data. Keep in mind, after this installation, your site will not look the same as our demo server! The only reason to install theme using this method, and not the HotStart method, is to keep data that you already have on the site. But in this case, after theme installation, you must setup many things manually. 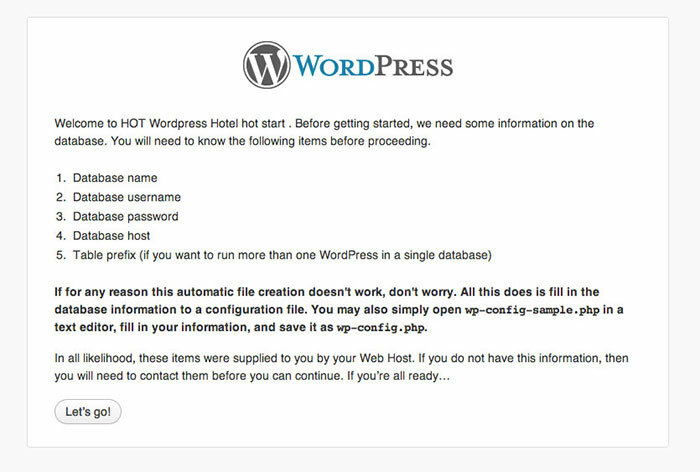 Our proposal in this case is to install HotStart in a subfolder and then learn how WordPress is set there. Then you can copy these settings on your live site. You should download archive “hot_themename_wp_unzip_first.zip” from our download section. Don’t try to install this file! As its name says, you should unzip it first! When you unzip this archive, you will have several files. The file you should use for the Basic Theme Installation is named as “wp_hot_themename.zip”. Make sure all folders of your WordPress have permissions set to 755. You can check this using any FTP program. All directories listed here must have status writable. From WordPress Dashboard, go to Appearance > Themes. Click the Install Themes tab. Click Upload link. Choose the file mentioned in the Step 1. The file name should be “wp_hot_themename.zip” (change “themename” with real name of your theme). Click Install Now button. After few moments, you will receive message “Theme installed successfully”. Click Activate link now to activate the theme. Step 4 – The result is different than what you’ve seen on our Demo? Yes, this is true! Since you installed theme only, demo data have not been installed. Most likely, your site looks messy now. You need less or more work to make it look properly. So, if you need theme with Demo data, please complete HotStart Installation. Step-by-step instructions are in the HotStart Installation part of this document. If you have theme that’s based on Sparky Framework, you can learn more about theme customization options on our dedicated page about our WordPress theme framework. Our themes are highly customizable. Some of the themes allows you to change layout, colors, font, widths, and so on. To reach the Theme Parameters , from your WordPress Dashboard, go to Appearance > Themes. You’ll see the list of all available themes. Click on the link Hot Theme-name Options to open the Theme Options page where you can set various parameters of the theme. Different themes have different parameters. We will not explain individual parameters here, because you can guess the parameter’s purpose yourself from its name. Also, you can read short explanations of each parameter on the Theme Options page. The themes usually come with several pre-defined color styles. The color style can be selected in the Theme Options page, in Theme Style section. Please keep in mind, if any pre-defined color scheme has been selected, then whatever you entered in the parameters below would be disregarded (however, you selection would be saved). To use your own theme settings, you must select Custom Style in Theme Style section to activate your custom settings. Here, you can edit a color’s hex number (555555), but you must not change anything else (special characters), otherwise you can get server error message. Widget positions are place holders for your WordPress plugins. If you install theme using HotStart method, all plugins will be pre-installed and placed in the appropriate widget positions. If you didn’t use the HotStart installation, then you must setup all the plugins yourself and select appropriate widget position for each plugin. Each theme demo contains several dozens of Widget Positions. We prepared a graphically presented “map” of all available widget positions for this theme. To find this “map” for your theme, please open this link http://demo.hot-themes.com/wordpress/widget_positions in your browser, and select the theme by its name. The image with widget positions map for this theme will be loaded. Typography determines what fonts will be used on your site. Themes come with different typography aspects, depending of the overall theme style. You would need to use different font styles for headings, subheadings, paragraphs, lists, quotes and so on. However, all those font styles should be in an harmonic relations. The art of typography starts there! Our themes come with pre-defined font styles for most commonly used elements of text. Furthermore, there are some additional font styles that you may find useful for your site. To see how all text styles available in a specific theme, please visit our demo server (http://demo.hot-themes.com/wordpress) and select your theme. Then select the Typography link from the menu. The Typography page will show you all text styles available in this theme as well as how to implement them on your text. Of course, you will need some HTML/CSS knowledge to create text elements (paragraphs, lists, block-quotes…) and apply style to them. The scope of this manual is not to teach you HTML and CSS. You may find so many books and video tutorials about HTML/CSS on the Internet. It’s assumed that you know a little bit of HTML and CSS. If you know how to create HTML elements (paragraphs, headings, lists…) and how to apply styles to the elements, you are experienced enough to read and understand the Typography page mentioned above.